This Sunday, I had the privilege of accompanying a student of mine to the North-American Chidon Hatanach — Bible contest. 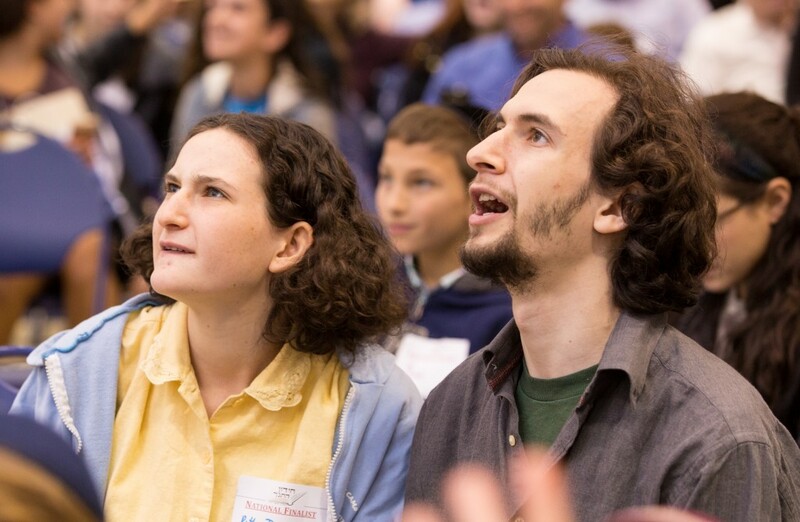 From Boston to Miami, and from New York to Seattle, Los Angeles, and Chicago, Day School students from across America, all gathered in New York to share in the joy of the study of Torah. The delight, engagement, knowledge, pride, and vibrancy could be felt in the air. The buzz that could be heard when a question was asked to the audience, the smiles on the proud faces of parents and relatives, and the intensity of focus on the faces of the contestants, were all a testament to how much this moment meant to everyone. Students from varying backgrounds showed that if there is one thing that can unite us as Jews, it is the study of Torah and the pursuit of education. Religious and non-religious students alike showed an astonishing depth and width of knowledge braided with love and pride of their heritage. Such deep pride, joy, and historical perspective were only possible due to decades of work that set the foundation for the excellent Day Schools, schools that service yet another generation of proud and accomplished Jewish children. Many children were from places in which one could have only dreamed people would know what being Jewish is—never mind having any knowledge of it. These students were able to easily you about places, events, famous people, and even quote verbatim from the Tanach without blinking an eye. Having a generation of well-educated students is not something we can take for granted. It is something that was created with a great deal of effort, or if you wish–with blood, sweat, and tears. It is something that requires–and constantly requiring– a great deal of sacrifice and the part of those who are constantly creating and enabling it; the parents who spare no time, resources, and efforts to make sure that their children get a good Jewish education, the communities who prioritize Day Schools and recognize them as a vital communal need, the teachers—particularly those who relocate to outside the large communities, and the philanthropists who value the cause of Jewish education and help them rest on a strong financial foundation. All these and more, cannot be taken for granted. They require our ongoing appreciation and recognition as the pillars of our existence. These were the words of PM Golda Meir to my grandfather rabbi Bernard Poupko, President of Mizrachi-Religious Zionists of America. Spoken almost 50 years ago, this message shows to be now truer than ever. Studies continue to show that a Day School education is key to maintaining a strong Jewish identity; providing the next generation of Jewish children with confidence and leadership skills, and preventing assimilation and disaffiliation. It’s as simple as that. Without Jewish education, there is no Jewish future, and with no Jewish future, there is no Jewish people. This is why Jewish education is a matter of national security. Looking at Jewish communities around the world, and particularly in North America, Jewish communal leadership has taken two similar, yet very different roads who diverged in history; one, was the road of focusing on synagogues and communal infrastructure, the other, was focused on Jewish schools and education. Now we know that that road of Jewish education is the one that made all the difference. Communities who maintained a strong Jewish education remained vital, relevant, and functioning. Those who did not usually faded away after two or three generations. When Golda Meir told my grandfather that Jewish Day Schools were a matter of national security, she was not exaggerating. Jewish education has always been, and remains, the veritable epicenter of Jewish continuity. At this time, we must make sure to keep it going and make sure that every Jewish child has access to this key to Jewish continuity and Jewish education– the road that makes all the difference.